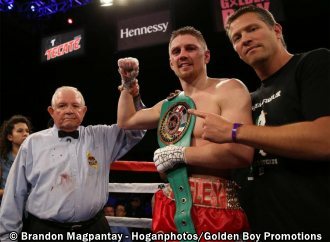 INDIO, CALIF. (Oct. 18, 2018): Jason Quigley (15-0, 11 KOs) of Donegal, Ireland defended his NABF Middleweight Title with a 10-round unanimous decision victory against Freddy "El Riel" Hernandez (34-10, 22 KOs) of Mexico City, Mexico in the main event of the Oct. 18 edition of Golden Boy Boxing on ESPN at Fantasy Springs Resort Casino in Indio, Calif. Quigley won with scores of 98-92, 98-92 and 99-91. "I felt great tonight. I knew it was a test," said Jason Quigley. "This was my 15th professional fight, and I learned a lot. Nothing surprised me about Freddy. I was prepared for him. I knew he was tough. I upgraded tonight. He's a great fighter, and I respect him a lot." "I prepared very well and made sure I gave a great fight to everyone," said Freddy Hernandez. "My conditioning was great as you saw in the fight. He [Quigley] was tired and didn't want to fight anymore. I felt that." In the co-main event, Eddie "E-Boy" Gomez (21-4, 12 KOs) of the Bronx, N.Y. scored an eight-round unanimous decision win against Shoki "El PV" Sakai (22-9-2, 12 KOs) of Amagasaki, Japan in a welterweight bout. Gomez won with three scores of 80-72. Rommel "The Legacy" Caballero (4-0, 3 KOs) of Coachella, Calif. scored a first-round technical knockout victory against Hugo Padron (3-3, 3 KOs) of Agua Prieta, Mexico in a scheduled six-round super featherweight battle. Filipino slugger Rey "Flash" Perez (24-10, 8 KOs) defeated Christian "Chimpa" Gonzalez (19-3, 15 KOs) of Buena Park, Calif. via technical knockout at 2:15 of the seventh-round of a scheduled eight-round lightweight fight. Edgar Ortega (10-1-2, 5 KOs) of Mexicali, Mexico dominated Filipino slugger Recky "The Terror" Dulay (11-4, 8 KOs) en route to a six-round unanimous decision victory. Ortega won with scores of 57-56, 58-55 and 58-55. Angel Ruiz (13-0, 9 KOs) of Tijuana, Mexico stopped Jonathan Fortuna (8-2, 5 KOs) of Santo Domingo, Dominican Republic at 1:40 of the fourth round of a schedule six-round super lightweight battle. Uzbekistani prospect Elnur Abduraimov(2-0, 2 KOs) scored a technical knockout win against Giovannie Gonzalez (5-3, 5 KOs) of Sacramento, Calif. at 2:38 of the second round of an 140-pound battle originally slated for four rounds. Quigley vs. Hernandez was a 10-round fight for the NABF Middleweight Title presented by Golden Boy Promotions. The event was sponsored by Tecate, "THE OFFICIAL BEER OF BOXING" and Hennessy, "Never Stop, Never Settle." The fights took place on Thursday, Oct. 18, 2018 at Fantasy Springs Resort Casino.